Rediff On The NeT: As the nation celebrates its golden jubilee, Captain Ram Singh, who scored the tune of India's national anthem remains forgotten. When a hero goes unsung, it hurts. More so if he composed the music for India's national anthem and Kadam kadam badhahye ja, khushi ke geet gaye ja, the theme song for Subhas Chandra Bose's Indian National Army, now sung by military and paramilitary personnel across the country. Captain Ram Singh, 87, who provided melody to both these patriotic songs languishes in Lucknow today. 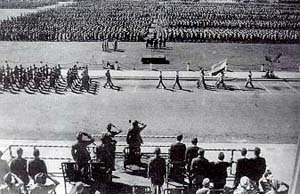 The composer, who joined the INA in 1942 and was taken as prisoner of war by the Japanese, is deeply disillusioned by India. He is hurt on not receiving a single invitation to the various official functions organised for the nation's golden jubilee. He is unhappy with the state of the country. "This is not the India of Netaji's dreams." he confesses. In conversation with Sharat Pradhan, Captain Ram Singh spoke about dreams that have run asunder and how Independent India has wronged him. We had conceived an India-free from all ills -- poverty, crime violence and humiliation. Unfortunately, these ills are the only things I have received from governments in recent years. What could be a greater humiliation for me than to be left out of all celebrations of the 50th year of our Independence. The only occasion where I was formally invited was in a school. I could not even attend that function because I was unable to climb onto the high police truck sent to fetch me. 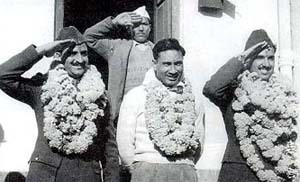 It was on July 15, 1942, shortly after the surrender of the British Indian Army before the Japanese in Singapore that General Fujiwara handed over some 40,000 prisoners to General Mohan Singh. 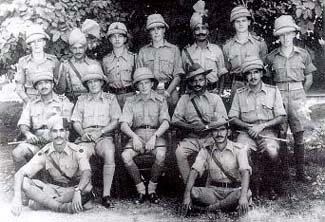 He along with Rash Behari Bose of the Independent League formed the INA. It was then that I was also inducted into the organisation by General Mohan Singh. About a year later, Netaji took over the command of this army. Netaji made all the difference to the movement which for sometime nearly shook the pillars of the British regime in India. He inspired us with his thoughtprovoking and dynamic speeches. He made it a point to remind us that it was the right time for India to awaken and take advantage of the World War by taking military assistance from Britain's common foe. Netaji reinforced in us the confidence that our Independence was not far. If it had not been for the air crash, after which there was no trace of Netaji, we would have got freedom as he had conceived. He was confident of military support from all those nations which were already engaged in war with Britain or its allies. That made all the difference. How could we have matched the might of a power like Britain without the help of others? Netaji was naturally encouraged with the response he received, that in turn gave us the confidence that we would win freedom. Besides the 40,000 troops that he inherited from Singapore, a large contingent of young volunteers got themselves inducted in the INA. The sublime faith everyone had in Netaji's leadership was depicted in their willingness to lay down their lives for our great leader and commander. Netaji attached great significance to music as a source of inspiration for a force that was being prepared to fight till the finish. I distinctly remember that day in 1943, which Netaji came down to the then INA broadcasting station at the Cathay Building in Singapore and asked me to compose music for a song translated from Rabindra Nath Tagore's original Bengali score. He asked me to give the song a martial tune that would not put people to sleep but awaken those who were sleeping. The Hindi version of that anthem was, Shubh, sukh chain ki barkha barse, bharat bhagya hai jaga. The translation was jointly done by Netaji and his close confidantes Abid Hasan, Mumtaz Hussain and Bhonsle. After I composed the tune, the first pat for the tune came from Netaji himself. It was a memorable moment for me when I was asked to play the tune while Jawaharlal Nehru unfurled the tricolour and lowered the Union Jack in New Delhi. While Tagore's original in Bengali was chosen as the national anthem, the tune composed by me in Singapore was formally adopted for the anthem. The Gramophone Company of India, which brought out a special album titled, Delhi Chalo containing Netaji's favourite songs, includes Shubh sukh chain ki barkha barse in the same tune as Jana Gana Mana. I composed all the songs in that album sponsored by the Netaji Research Bureau. I have also composed around 30 patriotic songs. On March 22, 1996, the court directed that an honoranium of Rs 1,000 a month should be given to him. In a contempt petition moved by him, the court once again on May 19, 1997, issued orders for compliance of its earlier verdict. But that too has met a similar fate and even as the nation proudly celebrates its 50th year of Independence, Captain Ram Singh waits on. EARLIER FEATURES: Who composed the score for Jana Gana Mana? Gurudev or the Gorkha?